It was a beautiful, sunny day with magic in the air and a record-breaking crowd in 2019. Rolled at 1PM. Streets closed at about 12:45 Lasted about an hour with prizes awarded at the Afterparty. A huge thanks to those local businesses that contributed parade prize items for all of our award winners! Thank you for your service to our community. We appreciate you so much! Our 2019 Queen and King were our Citizens of the Year, Michelle and Dave Kelsey. All Hail Queen Michelle and King David! Our Grand Marshal was the Abita Springs Middle School Teacher of the Year, Brenda Blades. Route: Middle School down Main Street to Pine to Level; right turn before cafe onto Hickory, left on Main back to school. Recently we added a children's costume contest for kids 12 and under. It was a big hit. This down-home party, will move back to the Trailhead this year, offering great food, drinks, and prizes awarded to the best or weirdest parade participants. So, if you're really going to get in the Carnival spirit, YOU GOTTA WEAR A COSTUME. 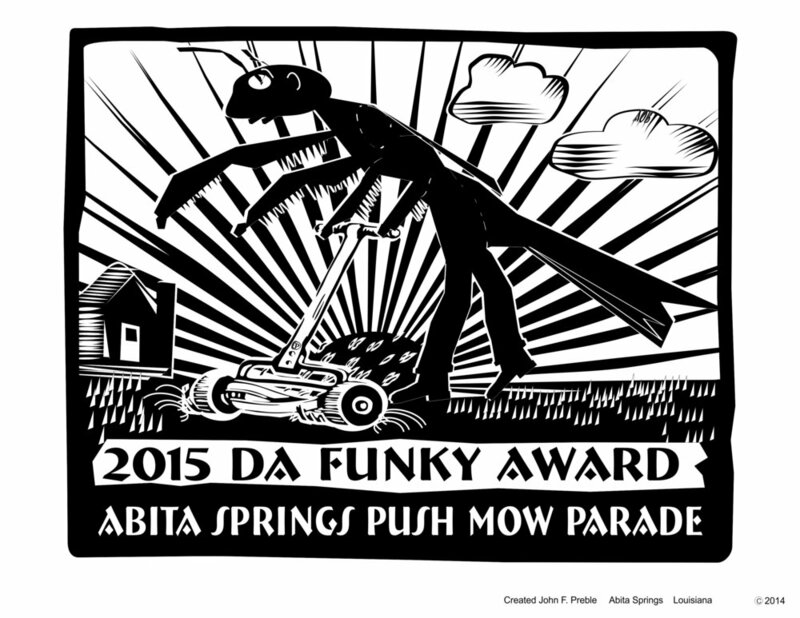 Prize artwork and award graphic above created by John Preble. Be amazed at his Abita Mystery House.